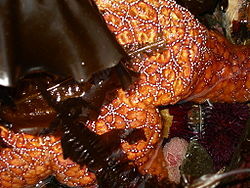 Pisaster ochraceus is generally known as the Purple Sea Star or Ochre Sea Star and is common along the Pacific coast. 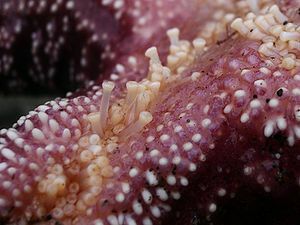 Two species that can be mistaken as Pisaster ochraceus are Pisaster giganteus, which has blue rings around white or purple spines, and Pisaster brevispinus, which is pink with small white spines. These two species have different aboral spines and coloration which allows one to distinguish between the species. Evasterias troschelii may be confused with Pisaster ochraceus at times aswell. It can be distinguished from Pisaster ochraceus because Evasterias troschelii has a smaller disk size and longer, tapering rays which are often thickest a short distance out from the base rather than at the base as in Pisaster ochraceus. Pisaster are mainly dioecious but there is no sexual dimorphism and sexes can only be separated by the presence of eggs or sperm in the gonads. They reproduce by broadcast spawning, which occurs in the Puget Sound around May to July. There is no parental investment beyond spawning. Fertilization occurs in the water column and Pisaster ochraceous develops through several larval stages. This sea star can be found in great numbers on mussel beds and on wave-washed rocky shores. The juveniles are often found in crevices and under rocks. Its depth range is from above the low-tide zone to 90 m in depth. Pisaster ochraceous is very durable and can tolerate a loss of thirty-percent of its body weight in body fluids. At the larval stage, Pisaster ochraceus are filter feeders and their diet consists of plankton. As an adult, Pisaster ochraceous feeds on mussels like Mytilus californianus and Mytilus trossulus. They will feed on chitons, limpets, snails, barnacles, echinoids, and even decapod crustacea. Pisaster ochraceous uses its tube feet to handle its prey. If the prey is too large to be swallowed whole, then it uses its tube feet to open shells and inserts its stomach. It digests the prey out side the body and then swallows it. Pisaster ochraceus has not been evaluated by the International Union for Conservation of Nature (IUCN). ↑ Kozloff, E. N. (1996). Marine Invertebrates of the Pacific Northwest. Seattle: University of Washington Press. ↑ 4.0 4.1 4.2 4.3 4.4 4.5 "Pisaster ochraceus (Brandt, 1835)". Encyclopedia of Life. Retrieved May 10,2010, from "http://www.eol.org/pages/598469". ↑ 5.0 5.1 5.2 5.3 Ramirez,Y. (2002). Pisaster ochraceus, Animal Diversity Web. Retrieved May 10, 2010, from http://animaldiversity.ummz.umich.edu/site/accounts/information/Pisaster_ochraceus.html. This page was last modified on 3 September 2011, at 01:27.